This last order was a completely different one. One time they must have had a run of pants that were marked incorrectly. I ordered my size and got a pair that was marked in my size but were way off. So I sent them back and ordered another pair. Received the replacement pair and they were similarly marked in my size but weren't. They weren't the same pair I had sent back since they were still in transit back to Ralph. Got a polo jacket in the wrong size last December. I guess it’s not meant for me to rock a pair of their corduroys. Just bummed about it haha. I was hoping they would offer me a decent promo code or something but oh well. Still love their stuff and will continue to purchase items. At least you got the $25GC. I didn't get anything. The 9.5oz Tulare wash. These are basically pajama pants level comfy. Those are utterly bad arse! Really am digging the 9.5 ounce Japanese denim. Might need to add those in spite of the vast majority of my RRL's being Slim Fit. I think one of my Slim Narrows is likewise around that weight. Those are about 4 years old and are the Kentucky Bluegrass wash. Has paint specks and other things of the like. Think I have worn them once or so. Last Week, Barneys had a pair of RRL Slim Fits in a killer wash that were $44. Could not believe how cheap they were. Lasted about 20 minutes, but they actually had the full range of sizes. They were the cheaper non US made ones, but still a really nice wash. I think the MSRP was $190 or so. Thought about ordering them, but something bothers me about RRL offering Jeans not made in the States. No doubt the quality is still quite good as the denim quality is still premium. Wise decision. For Purple Label anyway, Barneys and Barneys Warehouse has stupid good prices on Purple Label and also have a smattering on RRL as well. Both when on sale (almost weekly with Warehouse/sporadic at Barneys) are massively cheaper. On the negative, store credit or bust. Just actually missed out by a day waiting for the credit to process as both had a killer sale last week. Stinks as a Fiorini cashmere sweater at Barneys I wanted very much was $310 4 days ago and now $1100. Just ordered this leather jacket. Hopefully the lining isn't overly thick for SoCal winter weather. I'm looking for information (season/year, item name, original price, inspiration ala "inspired by 1940s...") for these 2 jackets. Through Monday. Code WAREHOUSE for 25% off. Question for you and everyone else that enjoys the low straight. The trend is towards higher waist cuts in almost every brand and RRL is showing more, especially with the special or limited edition. Do you see yourself shifting or sticking with the lower waist cuts? I find the 3Sixteen CT is the perfect fit for me. Slightly higher rise with more room in the top block but tapers nicely. 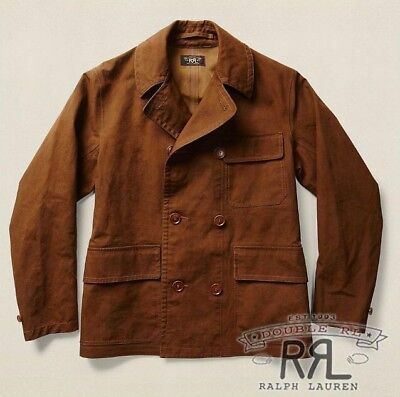 I wish I could find an RRL fit that is similar so I could take advantage to the great washes from RRL. I keep drooling over these patchwork cardigans. Too bad they are so expensive. I’m totally with you here on all counts. I find that the Rag & Bone Fit 2 Slim is the prefect fit for me. Plus the 98/2 blend is super comfy. Similar fit as your 3Sixteen CT.
RRL is one of the best in the business with their hand distressing and washes. I just can’t find the perfect fit for me.